at the LA County hospital in the seventies. Women went in to have babies. they are dusted in despair. In my dream, Maria sits at the river’s edge. Her baby has sprouted calla lilies on its head. refilling what’s been pillaged from her body. A shooting star burns the sky with silver rain. Her case was brought to trial, long overdue. his words, venom, spewing from a headless snake. I channel Maria’s stomping foot nailing him down. make us less valuable, Maria? No, alma. They had no right. The calla lily stands for resurrection. 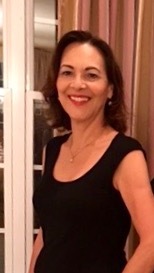 Louisa Muniz is a freelance writer and a reading/writing tutor. She lives in Sayreville, NJ. She is a recent retired reading specialist and takes pride in having been a National Board Certified teacher who traveled to China to learn about their educational system. She has a Master’s degree in Curriculum and Instruction from Kean University. Her work has been published in Rose Red Review and is forthcoming in Snapdragon: A Journal of Art & Healing. She is currently working on her first poetry chapbook.